Capernaum is one of the five films nominated for a foreign film Oscar this year, and has the distinction of having won the Jury Prize at the 2018 Cannes Film Festival. This heartbreaking film is challenging viewing. Director and co-writer Nadine Labaki hired non-actors who had lives very close to those represented in the story, which is of a Lebanese boy who lives in the slums of Beirut until he goes to prison for violent crime at 12 years old, which leads him to sues his parents for “bringing him life.” It’s like Slumdog Millionaire, but without any of its optimism, and it’s all the better for it. The lead character Zain has a stunningly difficult life. He works on the streets to get money for his family, but is nearly invisible to his neglectful parents, who never registered him at birth, effectively rendering him invisible. When they marry his 11 year old sister to their landlord, he runs away. After days begging for food and work, he encounters Ethiopian refugee Rahil (Yordanos Shiferaw) and her infant son, Yonas (Boluwatife Treasure Bankole) and the three become a cobbled together family, with Zain watching Yonas while Rahil works illegally. When she suddenly disappears, he has to find ways to keep both himself and Yonas alive and healthy, which is no easy feat without help. There is nothing charming about following Zain as he struggles. Unlike other films featuring child leads, there are no real moments of respite for this little boy. Zain never gives in to the part of himself that wants to just play, or be comforted, because that’s not an option. Filmmaker Labaki isn’t interested in giving the audience the kind of relief so absent from the children Zain represents, so Zain’s life doesn’t take a sharp turn for the better. The story only gets more chaotic, which will no doubt leave viewers feeling powerless as the end credits roll. Zain Al Rafeea, who was 12 when acting in the lead role of Zain, was a Syrian refugee living in Lebanon who, like many of the ignored, forgotten children in cities around the world, had never been to school, and worked on the streets to support his family and survive. He only learned to read and write after being in Capernaum. Likewise, Yordanos Sheferaw, who played Rahil, was not only taken to jail as an undocumented immigrant in the film, the same thing happened to her during the production. Beirut-born Boluwatife Treasure Bankole, who is actually a girl, was deported after the film to Kenya with her mother. Films that star children in crisis get judged even before the credits start to roll. That there are children in crisis, starving, working, and often dying in the streets of big cities and tiny villages is a reality of life. Why then, is it seen as melodrama when a filmmaker presents a fictionalized account of two such children? There is a naturalistic quality to the movie that must be based in part on the fact that Labaki encouraged the children to act spontaneously, using their own words. The mix of the fictional story and the elements of real life these performers brought into their scenes was what brought an undeniable truth to nearly every moment used in the film, which was cut down from over 12 hours of footage to a running time of just over 2 hours. Zain’s portrayal of his fictional counterpart is impressive, especially given what he told reporters of how he got through the shoot, “It’s easy. 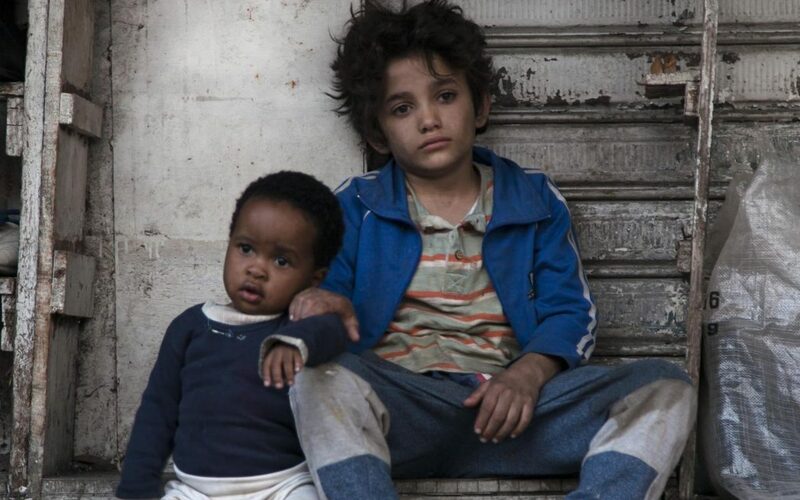 She asks me to sometimes be sad, sometimes be happy.” Though the movie is unrelentingly sad, Capernaum is a valuable addition to neorealism in world cinema, and has lots to offer for those who can stand its darkness.